After The Lost broke up in early 1967, Ted Myers, who had been the leader and main songwriter for the band, moved to New York City, where he was soon signed as a songwriter to the publishing company of producer Alan Lorber. 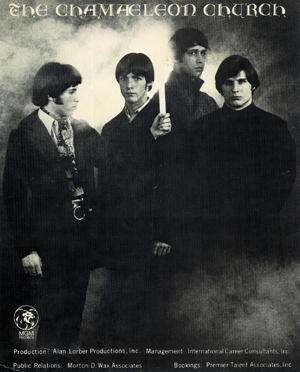 Lorber had an ongoing deal with M-G-M Records and told Myers that, as soon as he formed a band, they could record an album. Anxious to fulfill his dream of making his first full length album (The Lost had only released a few singles, although they had recorded an album’s worth of material for Capitol), Myers recruited Tony Scheuren (his new writing partner) on guitar, bass, keyboards and vocals, Kyle Garrahan (formerly of The Lost) on lead guitar, bass, keyboards and vocals and Chevy Chase (whom Myers had met while visiting Bard College several years earlier and who, of course, went on to comedy stardom on Saturday Night Live and in many films) on drums and keyboards. 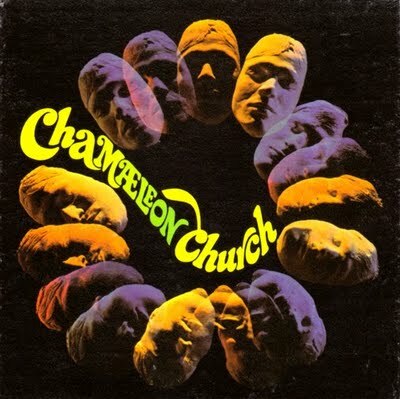 Myers and Scheuren soon penned an album’s worth of material and they released Chamaeleon Church in 1968, to little fanfare, though the band did make one nationwide TV appearance on ABC’s Showcase in the spring of ’68. The band broke up after just a few live gigs, with Chase and Garrahan preferring to stay in New York and Myers and Scheuren moving back to Boston, where they were recruited by the successful Boston band Ultimate Spinach in time for 1969’s Ultimate Spinach III. Myers then moved to California where he wrote a song that was covered by Three Dog Night (“Going In Circles”) and recorded another album with the band Glider on UA Records (1977) and an unreleased album with Incognito (1982). He now works in A&R for a record label in Los Angeles.